The Seattle, Washington Space Needle, built in 1962. Atomic Age design included elements of space exploration, scientific discovery, and futurism. Atomic Age in design refers to the period roughly corresponding to 1940–1963, when concerns about nuclear war dominated Western society during the Cold War. Architecture, industrial design, commercial design (including advertising), interior design, and fine arts were all influenced by the themes of atomic science, as well as the Space Age, which coincided with that period. Atomic Age design became popular and instantly recognizable, with a use of atomic motifs and space age symbols. Retrofuturism is a current resurgence of interest in Atomic Age design. Theme Building in Los Angeles International Airport. "Vital forms", or abstract organic forms, were identified as a core motif in the 2001 exhibition of Atomic Age design at the Brooklyn Museum of Art, titled "Vital forms: American art and design in the atomic age, 1940–1960". Atomic power was a paradox during the era. It held great promise of technological solutions for the problems facing an increasingly complex world; at the same time, people were fearful of a nuclear armageddon, after the use of the atomic bomb at the end of World War II. People were ever-aware of the potential good, and lurking menace, in technology. Science became more visible in the mainstream culture through Atomic Age design. Atomic particles themselves were reproduced in visual design, in areas ranging from architecture to barkcloth patterns. The geometric atomic patterns that were produced in textiles, industrial materials, melamine counter tops, dishware and wallpaper, and many other items, are emblematic of Atomic Age design. The Space Age interests of the public also began showing up in Atomic Age designs, with star and galaxy motifs appearing with the atomic graphics. Vintage atom-shaped ceiling light fixtures. An atom-shaped ceiling light fixture. Los Angeles International Airport's "Inside Encounter" lounge in its space age Theme Building. 1950s barkcloth table cloth with a geometric design and a botanical motif. Free-form organic shapes also appear as a recurring theme in Atomic Age design. British designers at the Council of Industrial Design (CoID) produced fabrics in the early 1950s that showed "skeletal plant forms, drawn in a delicate, spidery graphic form", reflecting x-ray technology that was becoming more widespread and familiar in pop culture. These botanic designs influenced later Atomic Age patterns that included repeating organic shapes similar to cells and organisms viewed through a microscope. There are similarities between many Atomic Age designs and the mid-century modern trend of the same time. Elements of Atomic Age and Space Age design were dominant in the Googie design movement in commercial buildings in the United States. Some streamlined industrial designs also echoed the influence of futurism that had been seen much earlier in Art Deco design. Whereas Atomic Age motifs and structures leaned towards design fields such as architecture and industrial design, Space Age design spread into a broader range of consumer products, including clothing fashion, and even animation styles, as with the popular television show The Jetsons. Beginning with the dawn of the Space Age (commonly attributed to the launch of Sputnik in October, 1957), Space Age design captured the optimism and faith in technology that was felt by much of society during the 1950s and 1960s. Space Age design also had a more vernacular character, appearing in accessible forms that quickly became familiar to mainstream consumers. Space Age design became more closely associated with kitsch and with Googie architecture for popular commercial buildings such as diners, bowling alleys, and shops. "Space Age design is closely tied to the pop movement [...] the fusion of popular culture, art, design, and fashion". Go-go boots by Andre Courreges, 1965. 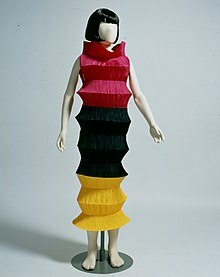 Issey Miyake's "Flying Saucer" dress. Two of the most well-known fashion designers to use Space Age themes in their designs were Pierre Cardin and Paco Rabanne. Pierre Cardin established the futuristic trend of using synthetic and industrial materials in fashion, with "forward thinking" innovations in his early 1960s work. Cardin "popularized the use of everyday materials for fashion items, like vinyl and metal rings for dresses, carpentry nails for brooches, and common decorative effects such as geometric cut-outs, appliqués, large pockets, helmets and oversized buttons". In 1964, Cardin launched his "space age" line, and André Courrèges showed his "Moon Girl" collection, introducing the white go-go boot style and other icons of the 1960s. The Japanese designer, Issey Miyake from Hiroshima, worked in Paris and New York from 1964 to 1970, and used many atomic age forms, and technologically produced materials in his work. In 1970 he moved to Tokyo to continue these innovations. Miyake cites his first encounter with design as two bridges his home-town, Hiroshima at the hypocenter of the atomic bombing of the city in WWII. Example of "dingbat" apartment facade. 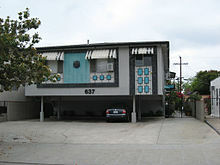 The dingbat apartment house, ubiquitous in the Los Angeles, California area were built between 1945 through the 1960s, fused a purist style with googie influence. The architect, Francis Ventre, coined the term "dingbat" for these quickly built stucco and frame simple structures. These structures often had a single exterior ornament in the shape of a starburst, boomerang, or pattern of rectangles. The Chemosphere house, designed by John Lautner in 1960, has become an icon of the atomic age home. The octagonal shaped house is cantilevered on a steep slope in the Hollywood Hills, California. At the time, Encyclopædia Britannica cited it as the "most modern home built in the world." ^ Rapaport, Brooke Kamin and Kevin Stayton (2001). Vital Forms: American Art and Design in the Atomic Age, 1940–1960. Brooklyn Museum of Art in association with Harry N. Abrams, 2001. ISBN 978-0-87273-145-5. ^ Jackson, Leslie (2007). Twentieth Century Pattern Design. Princeton Architectural Press. p. 97. ISBN 978-1-56898-712-5. ^ Dickson, Paul (2009). A Dictionary of the Space Age. JHU Press. p. 187. ISBN 978-0-8018-9115-1. ^ Elder, Alan (2005). Made in Canada: Craft and Design in the Sixties. McGill-Queen's. p. 33. ISBN 978-0-7735-2873-4. ^ Stecker, Pamela (1996). The Fashion Design Manual. Macmillan Educational AU. p. 28. ISBN 978-0-7329-0716-7. ^ Linda Welters, Abby Lillethu, ed. (2011). The Fashion Reader: Second Edition. Berg. p. 100. ISBN 978-1-84788-590-6. ^ English, Bonnie (2013). Japanese Fashion Designers: The Work and Influence of Issey Miyaki, Yohji Yamamoto, and Rei Kawakubo. Berg. ISBN 9780857850546. ^ Miyake, Issey. "The Concepts and Work of Issey Miyake". Issey Miyake | 三宅一生. The Miyake Issey Foundation. Retrieved 7 December 2015. ^ Piercy, Clive (2003). Pretty Vacant: The Los Angeles Dingbat Observed. San Francisco: Chronicle Books. ISBN 0-8118-4024-7. Retrieved 7 December 2015. ^ Rosa, Joseph; McCoy, Esther (1994). A Constructed View: The Architectural Photography of Julius Shulman. New York, NY: Rizzoli International Publications, Inc. ISBN 9780847817771. ^ Timberg, Scott (July 23, 2011). "Landmark Houses: John Lautner's Chemosphere". Los Angeles Times. Retrieved 7 December 2015. This page was last edited on 15 February 2019, at 01:26 (UTC).